This is a small Pandora’s Box, pattern by Kim Brackett, in Riviera fabrics from Connecting Threads. 42.5″ square. I’m participating in two UFO Challenges this year. The first is at Heather’s blog. She chose number 11 for April. That’s my Easy Street quilt. Here it is with the last stitch in the binding sewn down earlier today. The second challenge is at Aunt Marti’s blog, 52 Quilts in 52 Weeks. She chose number 2 for April. That’s my Big Star quilt which I actually finished in January so it was an easy month for me. Check out the April Parade of finishes here. For May, Aunt Marti chose number 12, which is my Double Delight. Yay! I finished it in February in a finishing spurt. Seems like once I get a quilt quilted, it just has to be finished. And, Heather chose number 9, which is my Asian Sampler. This one is twelve 12” blocks that I need to get laid out into a top. No idea what I’m going to do with it yet. This one will be challenging and I’ll be lucky to get the top finished by the end of May, let alone quilted and bound. This project was started on Judy’s blog as a Stash project and finished yesterday. At the beginning, I went gangbusters working on this until I got the top mostly finished in May of 2009 and there it sat for the next 3 years. The colored fabrics are all pretty much the same and are from Jo-Ann’s. The cream is actually a sheet from IKEA. 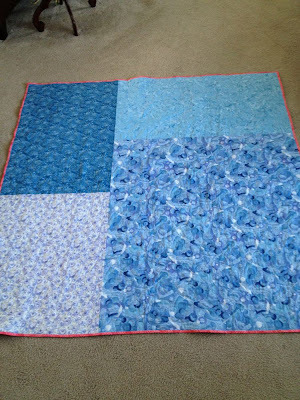 I pieced together the backing from four different pieces of blue in my stash. The binding is the pink that matches the pink in the blocks. The batting is Warm and Natural that was pieced together from some large leftover pieces. I quilted it with my favorite all over large meander. I love the texture it gives quilts. The finished quilt is 64″ square. A good lap-size quilt. Judy’s version of the quilt has several more borders making it a bit too large for me. 4/19/2009 – Started making the blocks. 5/23/2009 – Finished the top center. 9/1/2012 – Final border added. Made the binding. 11/21/2012 – Made the backing. Sandwiched the top. 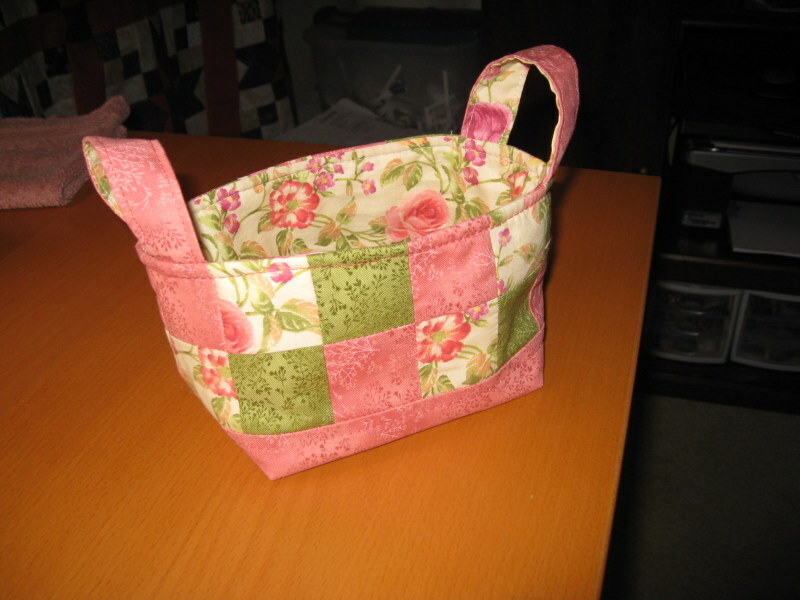 1/26/2013 – Quilted with all over meander. 1/27/2013 – Bound by machine. As promised here is my list of WIPs as we bring 2009 to a close. 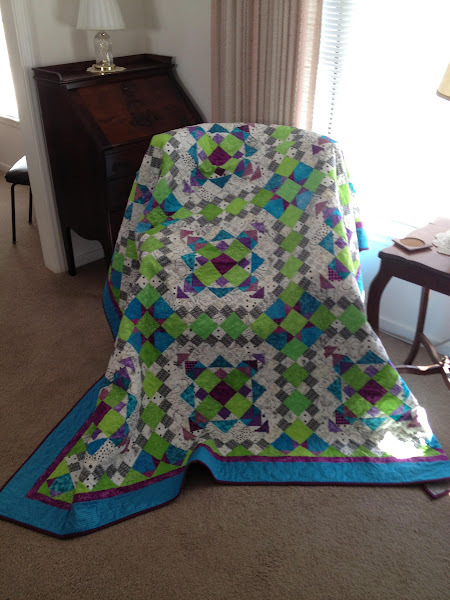 Just finished the quilt center for Judy’s Stash Project. 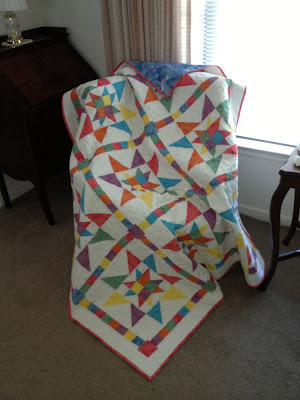 I have to admit along the way, at times I wasn’t crazy about this quilt or my choice of fabrics. Now that the top is together, I really like it.The one lesson I learned though is that yellow really does read as a light. In certain lights (such as the picture), the yellow just disappears into the background. And, here I thought it was pretty bright. Since I didn’t know what I was going to do for the border, I just used assorted 3″ squares of the same fabrics for the sashing cornerstones. I’m ready, Judy, when you get around to posting the border instructions. I’m so ready for this long weekend. I have been on the go for the past six weeks with no time for me. I’ve been to Reno for Zonta; Connecticut on business and work has been crazy. So this is MY weekend. It is foggy and cold here in the bay area so it’s a perfect day to stay inside sewing. I have done a bit of sewing since I last posted. Here’s a little basket I whipped up on Mother’s Day weekend for my Mom. I think these are so cute, I couldn’t resist making one. Here’s what I’ve got in store for me today. At least this is what I think I’ll be doing. Who knows what I get into. Jared Takes a Wife gets borders today. I chose to make it with 20 blocks instead of 30. 20 blocks with sashing and borders just fits my queen size bed (to the skirt) without covering the pillows. That’s the way I like it. So today I’ll add the green and purple borders. I’ve kept it in two pieces so it will be easier to quilt and then I’ll join them. And, then this is where I get stuck every time. 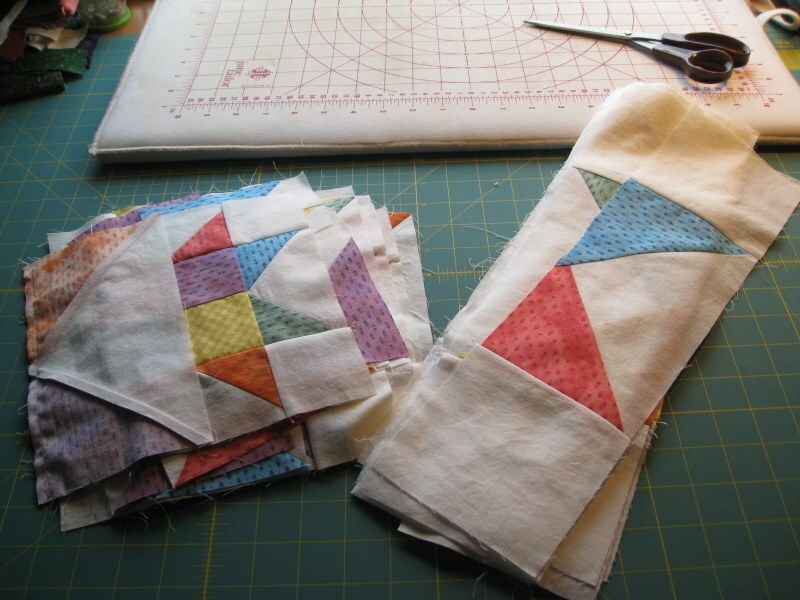 What to do for the quilting. I’d live to hear your ideas for how to quilt Jared Takes a Wife. 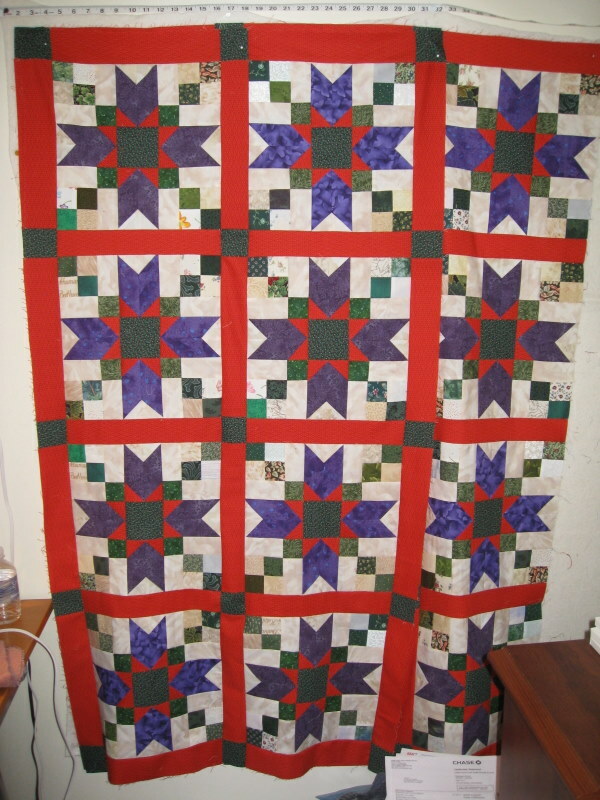 I’m been sitting here staring at it on my design wall and aside from something in the sashing and straight line quilting on the green squares, I’m not sure what to do. 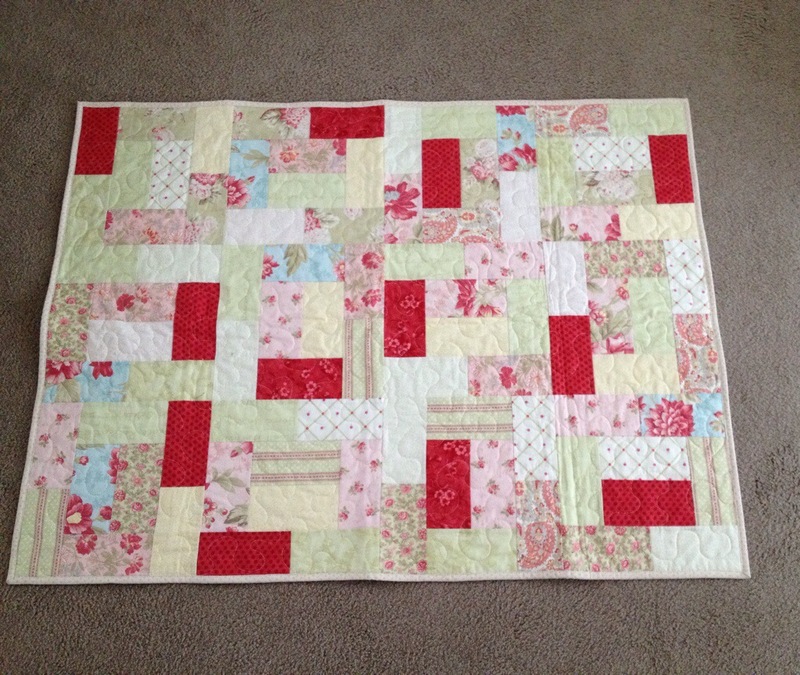 Next up, I’ve got to finish putting together the big blocks for Judy’s Stash Quilt and then move on to the sashing. Judy hasn’t posted the border directions yet so hopefully I’ll be caught up by the time she does. 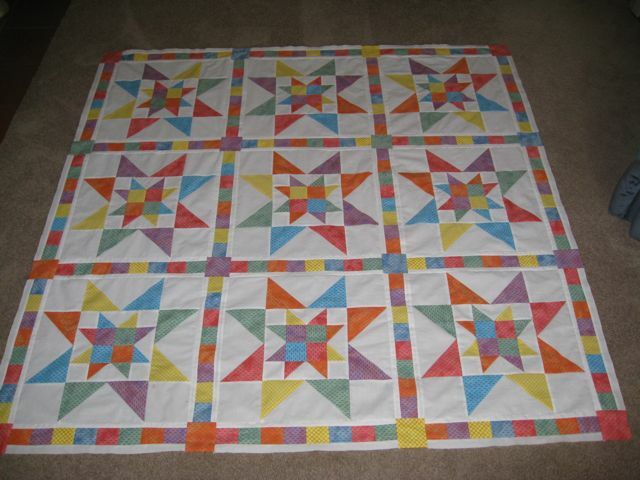 Then I’m hoping to get the borders quilted on my Orange Crush quilt. And, if I’m really ambitious, I may figure out how I want to quilt the borders on OTR. Whew, if I get all that done, I’ll be ready to go back to work on Monday. 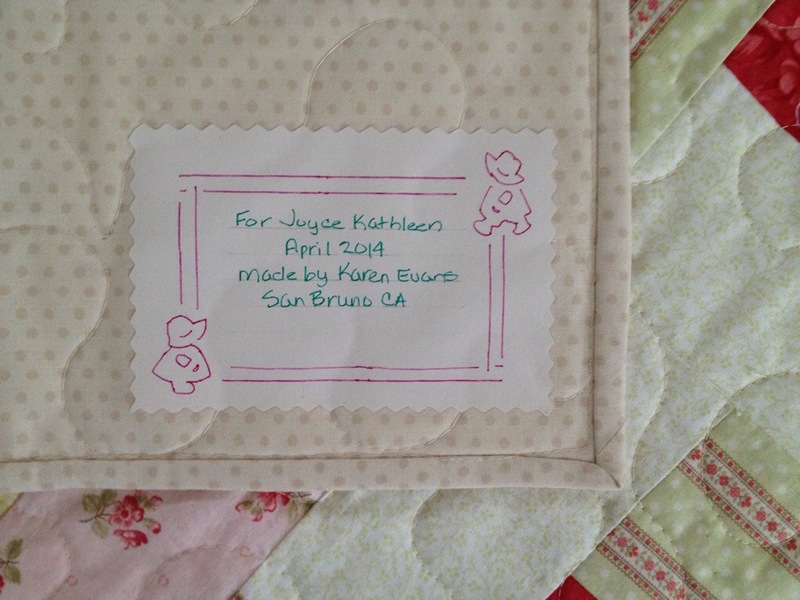 Thanks for stopping by and do leave me a comment about quilting ideas for Jared!